Pricing Scout instantly estimates your home's value. Pricing Scout is a free tool that instantly estimates your home's value based on nearby comparables. We employ a sophisticated comparative market analysis algorithm. That's a fancy way of saying that we look at the sale prices of similar homes within your neighborhood to identify the highest price at which you can sell your home to serious buyers fast. - View recently sold comparable properties in your neighborhood. - Local real estate home characteristics to inform your listing. - Receive an Estimated Market Value. Pricing Scout will give you a list of real estate comparables, based on the address entered. Our property valuation tool gathers nearby comparable properties based on number of bedrooms, number of bathrooms, and home square footage. 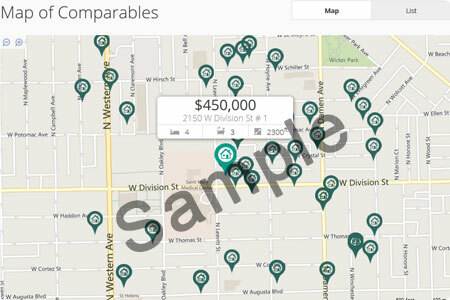 See how your home compares to nearby comps. How much your house is worth is based on square footage, price, and price per square foot. Our property valuation tool will show you where your home value falls on the scale based on nearby properties.